Nature abounds with amazingly effective remedies for the skin! For centuries, clay is known to have the ability to bind toxins and possess numerous minerals that are nourishing and beneficial for the skin. It is used to remove debris from under the skin, reduce pore size and improve skin tone. As clay is a powered dried mud that can cause some drying of the skin, honey is a superb choice for rehydrating and combining the clay. 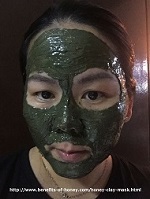 French green clay naturally and effectively pulls dirt, impurities from the pores. It is helpful in killing acne-causing bacteria, preventing breakouts, and drawing out blackheads, hence a perfect option for people with acne and oily skin. It also acts as a mild exfoliator. Honey in this recipe acts as a humectant, it draws in moisture and helps keep the clay from being to drying. This hydration helps to keep the skin becomes supple and soft. Honey is also naturally rich in anti-oxidant properties and vitamins to nourish and protect the skin. 1. Clean and dry your face well. 2. Blend and combine all the ingredients using a wooden or ceramic bowl and spoon. 3. The resultant mixture should not be too runny so that it can be plastered on the face. 4. Apply the clay mixture on the face and leave it for 15 minutes. Avoid leaving the mask on the face for too long until the clay should not become pale, dry and crumbly as this can have over-drying effects on the skin and cause the skin to feel tight. 5. Wash and rinse off the mask with warm water. 6. Enjoy your smooth, nourished and rejuvenated face! 1. The raw honey can be any of any floral varietal you have on hand. Raw honey is most ideal because it is full of beneficial enzymes. For acne-troubled skin, you may wish to use Manuka honey for a stronger antibacterial and anti-inflammatory potency. It may be a costly honey choice, but fortunately we don't need that much for a face mask. 2. For enhanced illuminating and hydrating results, add a drop of pure rosehip seed oil which is full of rejuvenating essential fatty acids, vitamins, and antioxidants. It is also known to be effective in correcting dark spots, patchiness and reducing scars and fine lines. This deep cleansing purifying clay mask is suitable for all skin types. Incorporate it into your weekly beauty routine for a well smooth and brighter skin. This natural solution perks up the skin and works way better than those expensive chemicals and medicines you get from the pharmacies. Furthermore, it's such a simple recipe. This mask literally takes just a few minutes to prepare! 1. Testimonies by our visitors on honey homemade remedies in "Honey Natural Beauty Health Tips!" 2. DIY face mask recipes for different skin types: Easy Face Mask Recipes for Different Skin Types. End of "Purifying Honey Clay Mask". Go to "Natural Skin Care"